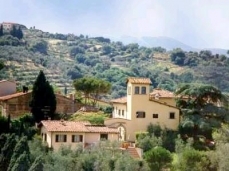 Exclusive villa rental in Florence perched on a hilltop west of Florence, Italy. In a small hamlet, on a hill in the environs of Florence, with a superb view of the city and the countryside, this private, renovated mansion house built in the 12th century could welcome for a quiet, relaxing holidays. Panoramic garden equipped with Jacuzzi tub open from mid may until mid september and heated by the sun. The bedrooms on the first floor is air conditioned. Tastefully re-furnished and decorated, the interior is very cozy producing a most pleasant effect with it`s character and individuality. Villa Interiors: Upon entering the main entrance you are in the large living room with its open fireplace, original cotto floors and lovely beamed ceilings. There is a tv with satellite connection ( CNN ), shelves of books and a glassed in-door to the garden. On the left of the sitting room is a decorated studio-room which can be used as a double bedroom. Also from the living room, there is a door to the laundry room complete with washer, ironing facilities and a full bath with open shower. The Tuscan kitchen has a spacious firegas stove, electric oven, microwawe, the american coffee machine and a small table on which to prepare food. In addition there is an abundance of cooking utensils, pots and pans. The formal dining room can be accessed from the kitchen or via a series of stairs situated between the kitchen and the living room. It has a window and glass door which look out into the garden and also has an open fireplace, cotto flooring and beamed ceilings. There you can find the fixed telephone with a plug available also for mobile pc for internet connection. Under the living room is a medieval cellar with stone walls and a curved brick vault. During the restoration antique ceramics were uncovered here. Up the stone stairs are two doubles bedrooms and a large bath with tub. The first bedroom is graced with a four poster iron king size bed and beamed ceilings and truly is " a room with a view" over Florence with the Duomo. 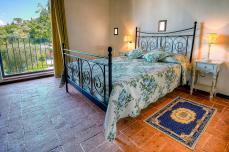 The second room, has a double bed, antique cotto floors and a ceiling with 19th century flowers decor; both bedrooms are equipped with air conditioning. The large, comfortable bathroom is tiled and has an old wooden glassed in linen case and old paintings on the walls. Behind the villa is the pensile garden, with iron furnishings, Jacuzzi pool and amazing views of the city of Florence area, villages, the Arno Valley and a 18th century Monastery. 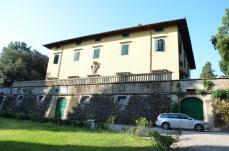 The villa has allotted parking space and is ideally situated for those who wish to enjoy Florence (only 15 minutes drive ! ). It is also only 3 miles from the entrance to the Florence-Pisa and Milano Roma motorways both of which will connect easily to the major cities and villages of Tuscany. There is a Lady cook available to prepare Tuscan dinners at home for an affordable price and can speak english. Dorothy Lin Jun 15, 2013 14:06 Thank you so much for the use of your villa. We throughly enjoyed the stay here. The area is charming and you have decorated the house beautifully. I hope some time we can visit again. If you are ever in Huston, Texes, please do not hesitate to call us - we would be happy to show you around.